We have a management system by processes and departments that integrates the disciplines of Quality Management, Environmental Management, and Occupational Safety and Health Management. 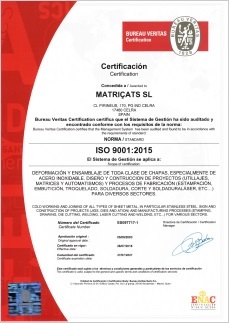 Since 2003, we have held ISO 9001 certification, awarded by Bureau Veritas, certificate number ES017375. We also obtain approval certificates from our customers in each of the many areas, sectors and disciplines in which we work.